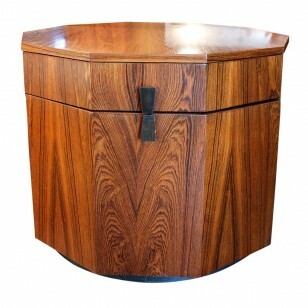 United States, 1950s Designed by Edward Wormley for Dunbar, this trim cabinet in walnut-stained mahogany features recessed door pulls and a leather-wrapped base. It has two adjustable shelves. USA, 1950s This cabinet is comprised of five separate components: table base, two drawer units, cabinet with sliding panel and shelf with small drawer, and upper bookcase. Expertly refinished, labeled inside drawer. 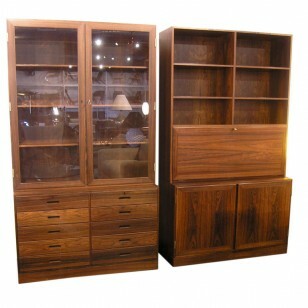 Depth of upper cabinet and bookcase is 12.25″. 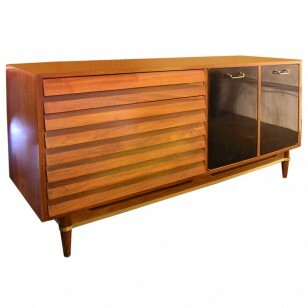 USA, 1950s This mahogany cabinet was designed by T.H. Robsjohn-Gibbings and manufactured by Widdicomb. It features three doors, two of which conceal six spacious drawers, and one which opens to reveal open storage with an adjustable shelf. 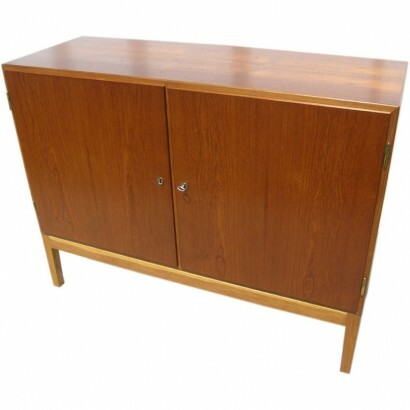 USA, 1950s A beautiful example of Tommi Parzinger’s work, this three-door cabinet comprises a white lacquered case set with brass studs on a dark mahogany base. Unique brass pulls reveal adjustable shelving and three deep drawers behind the cabinet’s doors. 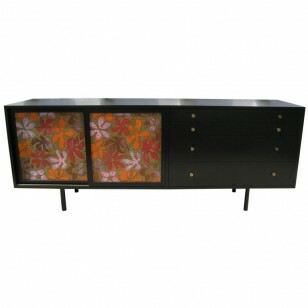 USA, 1970s This sideboard by Milo Baughman is composed of an ebonzed wood body with four burl wood doors. 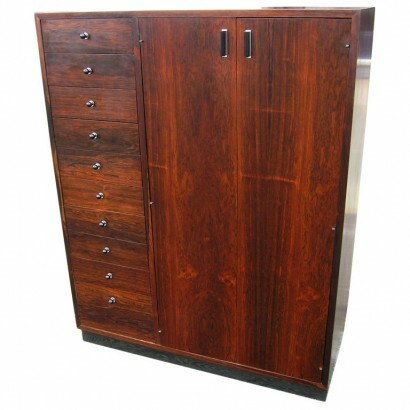 The doors feature recessed handles with chrome details, and they open to reveal four shelving compartments. 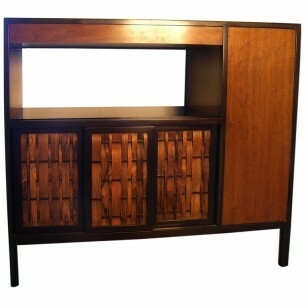 USA, 1950s Designed by Paul McCobb for Winchendon Furniture’s popular Planner Group line, this petit cabinet is constructed of solid maple and features grasscloth doors that slide open to reveal two shelves. 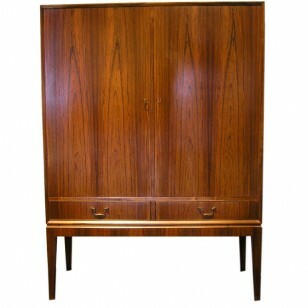 USA, 1950s This cabinet was designed by Harvey Probber and is composed of mahogany and brass. It provides ample storage with its three drawers, one enclosed shelving area, and one open shelf below. East Asia, 1940′s Small Asian cabinet with hand-painted gold decoration in the bird and flower motif. Cabinet doors open to reveal one inner shelf. USA, 1960′s This beautiful two-piece cabinet features open and closed shelving in the upper portion and two cabinets with drawers in the center in the lower portion. 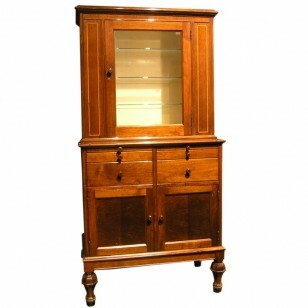 An excellent storage piece, it has been completely restored to its original beauty. USA, 1920′s Beautiful vintage medical cabinet featuring 3 original glass shelves behind a glass front door, 4 drawers and a pull-out shelf, and additional storage below. USA, 1950′s This cabinet features whimsical flower-patterned enameled doors which slide open to reveal 2 pull out trays on either side. Four drawers, one of which is divided, provide ample storage. Legs have been replaced. 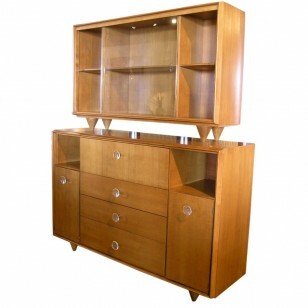 USA, 1970′s This gorgeous Paul Evans Cityscape PE-632 cabinet is constructed of unique olive burl veneer with polished chrome end panels. 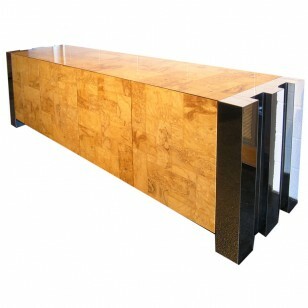 It features 4 doors which open to reveal a drawer and 2 adjustable shelves.